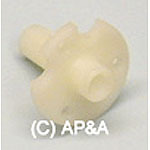 Nylon flipper bushing used on many Data East, Sega, and late-model Stern Pinball games. Replaces original Data East blue plastic bushings. Old original bushings are often cracked or broken on most games. They keep your flippers centered properly- from side to side, and up/down. 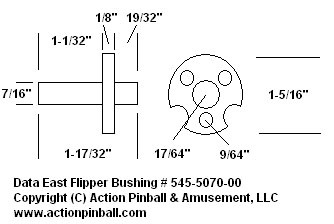 Loose, broken, cracked, or otherwise worn out bushings can cause flippers to be sloppy, lose strength, and often come in contact with the playfield surface, causing premature wear to the artwork and finish. If rebuilding your flippers, don't forget new flipper bushings! Replaces # 545-5068-00 and Wico # 18-002000 & 15-362290. NOTE: Does not fit on vintage Stern pinball games made in the late 1970s and early 1980s. Use # 4A-111-W-1 for vintage games.